Norman Darmanin Demajo born in Naxxar on April 12, 1952. He started playing football at school, but he was 17 years old, and studying at the Junior College of the Malta University, he was spotted playing soccer in the inter faculty league and was lured to join Qrendi FC by their president Joe Mifsud. 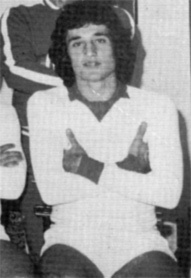 After a four year spell with Qrendi FC he joined Valletta FC in July 1973 where he stayed till the end of 1981-82. During his nine season spell at Valletta, he won the League and FA Trophy three times each, and was ever present in the three club competitions - Champions Cup, Cup Winners Cup or UEFA Cup. He also helped the team win other competitions such as Independence Cup, the Testaferrata Cup and the Sons of Malta Cup. When he was 30 years old, he decided it was time to move on and seek new challenges and accepted and offer to play for Melita for one season. in 1983-84 he joined Luxol St Andrew's FC, who had been accepted into the MFA fold. Norman played for St Andrew's FC for another seven years before retiring, at the end of season 1989-90 at the age of 37. During this period, Norman was also involved in the club’s administrative structure and served both as a council member for St Andrew’s FC and also as an executive committee member of the Malta Football Association. During his nine-season spell at Valletta, he won the League and FA Trophy three times each, and was an ever-present in the three club competitions – Champions Cup, Cup Winners Cup or UEFA Cup. He also helped the team win other competitions such as the Independence Cup, the Testaferrata Cup and the Sons of Malta Cup.